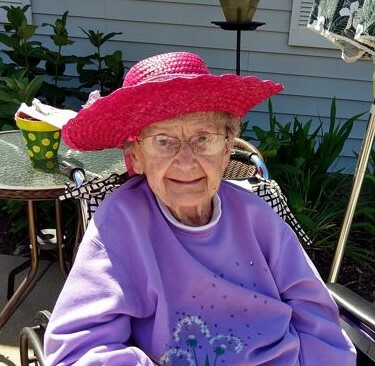 Frances Sikora, 97, of Milwaukee, Wisconsin passed away surrounded by her loving family on March 23, 2019 at Brenwood Park Assisted Living. She was born January 7, 1922 to the late Stanley and Stella Price. Frances married the love of her life Edward Sikora on June 21, 1947. Frances will be dearly missed by her children Alan Sikora, Dennis Sikora and Janice Esser, as well as by her beloved grandchildren Scott Sikora, Jackie Esser, Jamie Noble, Jeremy Esser, Kaitlin Sikora, Kristin Jones and her six Great Grandchildren. She was preceded in death by Edward, her husband of 47 years. A celebration of Frances’s life will be held at Saint Matthias Parish (9306 W Beloit Rd, Milwaukee, WI 53227), on Friday March 29th, 2019. Visitation is from 9:00 am - 10:45 am with a Catholic Memorial Mass at 11:00 am. A luncheon to follow at Meyer's Restaurant (4260 S 76th St, Greenfield, WI 53220). At 2:15pm Frances will be laid to rest at St Adalbert Cemetery (3801 S 6th St, Milwaukee, WI 53221).